Cats will sometimes bring their kittens to their owner, perhaps to introduce the kittens to the rest of her family. 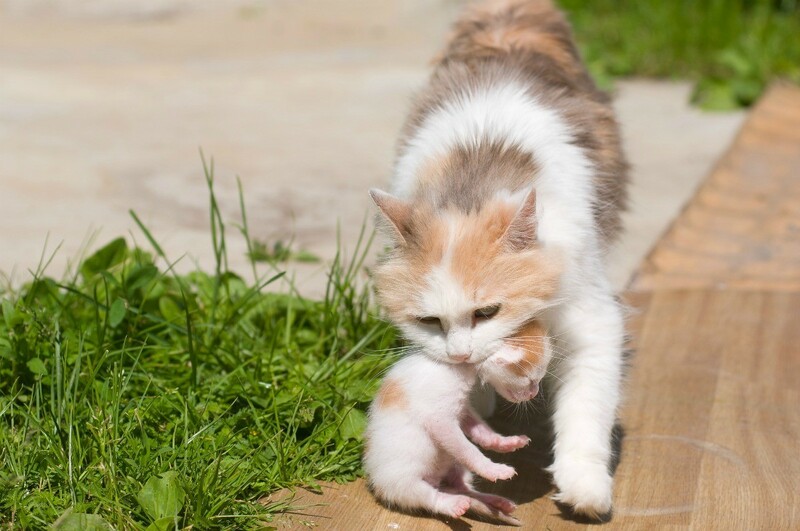 This is a guide about mother cat bringing kittens to owner. This morning my cat had a litter of 4 kittens. I made her a bed in a box and she was fine with it. I went to sleep and woke up at 4:30am to the sound of shuffling and meowing, and saw that she was putting the kittens under the bed. Without thinking, I grabbed them and put them all back in the box! I was afraid it would be unsafe for them under the bed. She didn't pay attention to them for a while. Well after trying to go back to sleep she brought one kitten to me. Then after 15 mins she brought another one! The other two are still in the box. I don't know what to do. Should I leave them alone? Or bring them to her? Why would she bring them to me one at a time? I'm afraid she will abandon them since I touched them without gloves. There may be too many kittens for her milk supply. Supplement with formula. Cats are very particular about where they want to keep their kittens. If you can fit the box under the bed for her let her do that. If not try a few boxes with bedding in the room you want her and let her choose. If she chooses your dresser drawer...well...it wont be the 1st time and they grow up fast. There should be no problem with you handling her kittens. She will be looking to you as a helper if you have a good relationship. I would put the kittens back in the box with the other two. With a little while to settle down she should get back in the box with the kittens. 4 kittens is a nice size family. She should not be overwhelmed. It can take a day or so for milk to come in. Make sure the room she is in is warm (very important), has a litter box and food and water available at all times. Keep this part of the house peaceful and quiet for her, with no other animals to bother her. She will come into heat again pretty quick so keep her in the house until the kittens are grown (5 months or so) and get them all spayed/neutered.Check with your humane society. They should be able to save you some money. Does your cat bring you kittens at different moments? My cat Mable seems to bring me the ones that are not on the same schedule as the others. So which ever one is awake when the others are asleep, she will bring it to me to try and calm it down. It never is the same one, it is almost like she is trying to get them on the same routine all together. Do you think it is possible? Can anyone else who has had experiences like this, please help? I think it is important to tell you that I helped her deliver 4 out of 5 babies, by her choice, and she has brought me every single one of her kittens on different occasions. She is also in heat big time. She is meowing quite a bit. I don't know how to help or what she really wants. Also she lets Cara my female puppy carry the kittens and help her move them. This seems like pretty special behaviour. Any thoughts? Female cats who live together, especially siblings, will often help each other birth and care for babies. This is normal. It's more unusual for your cat to let the dog help care for the babies, but it probably just depends on whether she considers the dog a sibling. Your cat brings her kittens to you so they will get used to being handled by humans. She realizes that they are domesticated cats who will have to rely on humans for for their food and shelter. Less domesticated cats behave instinctively, fiercely guarding their kittens. More domesticated cats may realize that humans and dogs will play a big part in the kittens' future. My cat had her kittens around 3 weeks ago. She had 3, but one sadly died (unknown reason). At around 1 week old I noticed the little girl was breathing very fast. She doesn't have her mouth open and you can't really hear anything. She was fine feeding and didn't struggle to breathe. We took her to the vet. The vet took x-rays and couldn't see anything wrong with the kitten as she appeared fine. It was literally that her breaths per minute were high, like 80. The vet gave us some antibiotics anyway because she thought there could be a slight infection. After a week on the medication nothing changed. We spoke to a different vet to get a second opinion. The vet said she may have been premature and could just be slightly deformed or underdeveloped and time would tell. So anyway. Shes 3 weeks old now. She seems fine. Is playing, feeding, wWalking around, and seems strong, but is still breathing fast. She is also a little underweight. Shes 220g. A lot smaller than the boy, at 380g. Last night my cat was acting really weird. She kept meowing and chirping at me and the kittens, for like hours. I gave her food, changed her litter in case she needed a toilet, but nothing helped. Its like she couldn't sit still. I woke up at 3 in the morning to see she had moved them both onto my bed while I was sleeping. I left her on my bed with them because I didn't want her to try and move them again and end up hurting one as my bed it quite high up. The next morning I moved her and the kittens down into the bed I've made them. (It's still in my room, very close to my bed.) She seemed happy with them being back in there and would lie down with them and sleep in there with them. Tonight she is chirping and meowing again so I decided to get a video and all of a sudden she moves the kitten back onto my bed with me. It was the sick one. She laid down to try and calm it while keeping her eyes fixed on the other one. I quickly got up and grabbed the other one and placed it next to her as I could see she was unsettled. She is now fast asleep with the kittens and seems relaxed. What could be the reasoning for this? I though maybe she was bringing me the sick kitten, but she brought both up last night and is now fast asleep and seems fine. I'm just puzzled. This is a stressful situation for your cat. She obviously loves and trusts you, and sees your bed as a safe place. That is probably why she is bringing her kittens to you. So glad you get the little girlie a vet check! Mommy may feels she needs help caring for the babies (perhaps mourning the loss of one of her babies and the fear that she will lose the others so she seeks your help to protect or--if she is not making enough milk--feed them) or she is just tired and needs a second set of eyes and "hands". If everything with the kits stays well, maybe have mommy checked out so she gets a good post partum bill of health! Post back what you learn! Prayers for all!! It certainly sounds like you are doing all you can for this mom and her babies. When you talked about one of the kittens that was breathing fast in spite of antibiotics I thought of a friend whose cat had a litter and one of the kittens was breathing fast. No other symptoms but that. A trip to the Vet in the middle of the night found that the kitten had a hole in his diaphragm. It had no doubt been there since birth, and the kitten had gotten big enough that something had slipped through the hole and taken up enough space that the lungs couldn't work properly. Sadly the kitten was very young (a couple weeks) and not healthy enough for the surgery to fix it. This birth defect can be hard to diagnose as it doesnt always show well on an x-ray. This may have nothing to do with what is going on with your kitten, but thought it was worth mentioning. Best of luck to you. You sound like a great cat mom. My cat just had her very first litter of 6 kittens. I have never been through this as a owner, but momma cat is worrying me because she keeps taking a kitten out of the pack and I don't know if it's the same one or a different one cause they all look alike. But she will randomly bring one out and do nothing. I put her and kitten back with the rest and then a good while goes by and she will do it again. Tonight she brought one all the way into my room from the living room and I just grabbed her and her kitten and put them back out there. Why is she doing this? It really worries me for the kitten. What can I do to make her stop or is she trying to tell us something? Please help. I have never done this before. Aww! Congrats on the litter. If you are concerned about a kitten being underfed or shunned, you may want to talk to your vet about the best method to hand feed. It sounds like you can't tell if is always the same one. You could try a tiny dot of nail polish on the tip of the tail. That way you could tell if no is doing this with one or all. Hopefully it is she is just proud of her babies and is sharing the joy. She is complimenting you! She trusts you with her kittens. Thank her, play with the kitten and bring it back. I haven't had enough litters at my house to be sure what this means. 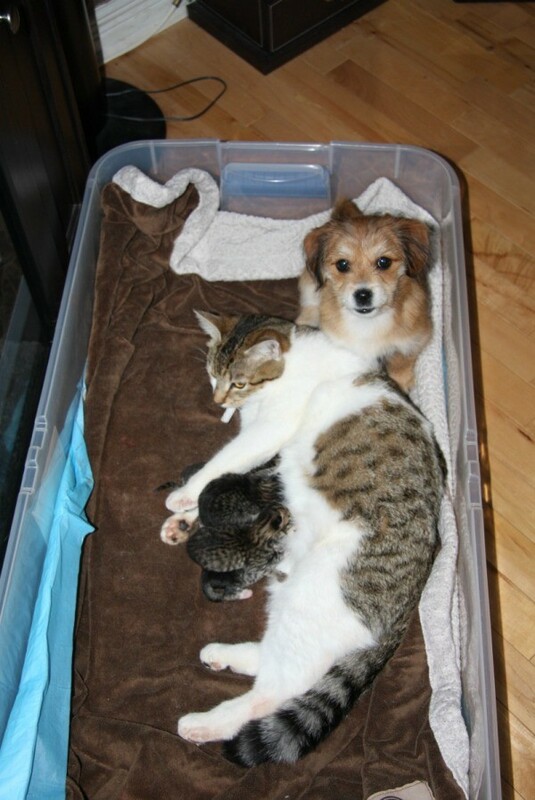 I would be worried that the mom cat thinks there is something wrong with the kitten she keeps moving. Take mom and the kittens to be evaluated by the Vet. The Vet can show you how to feed the kitten if mom cat rejects it. There are good products available for this at the pet store, like KMR kitten milk. Watch Mom and the kitten to see if she is nursing the kitten. It helps to get a scale and weigh the kittens daily to see if they are gaining weight. This will help you and the Vet make a decision about what you can do for the kitten.